At the chic, boutique Gramercy Park Hotel, special winter rates starting at just $545 through March will include a complimentary room upgrade at time of booking plus a $75 food & beverage credit. We'll also secure VIP reservations for you at the famous Rose Bar, the hotel's happening hot spot. In midtown, overlooking Central Park South, the beautifully renovated Jumeirah Essex House offers a "Shop & Stay Escape" with rates from $309/night inclusive of a 15 percent savings certificate at Bloomingdales on 59th Street, a complimentary cappucino, free package delivery (for packages totalling $250-plus), an appointment with a personal shopper and a special Bloomie's gift. If sheer luxury is your style, take advantage of the 1904 Suite Promotion at The St. Regis NY featuring one night in a posh one-bedroom suite for $2,100 with the second night priced at just $4. 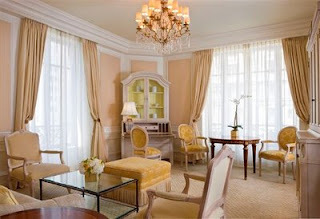 Additional suites (like the Fifth Avenue Suite, pictured) range in price from $2,400 to $2,950/night, with the second night still priced at just $4. Rates include daily continental breakfast for two. All promotions are valid through March 31, 2009. For more details on these and other NYC getaways, contact The Elite Travel Gal. Bali Bound: Join Us to Eat, Pray & Love!